(Compiled from articles by Geoff Bennett at NPR and Michelle Nichols at Reuters) – President Donald Trump…will attend the annual United Nations General Assembly in New York [this week], which brings together leaders of the 193 member nations for a week of meetings and speeches. As president-elect, Trump called the U.N. “just a club for people to get together, talk and have a good time.” But it’s a “new day” at the U.N., said U.S. Ambassador to the United Nations Nikki Haley. “The U.N. has shifted over the past several months [since President Trump took office]. It’s not just about talking. It’s about action,” Haley told reporters Friday in the White House press briefing room. Haley and Trump’s National Security Adviser, (retired Army General) H.R. McMaster, outlined the president’s goals for this week’s U.N. summit. McMaster said Trump will push a message of “reform,” calling for more transparency and accountability at the U.N.
“The United Nations, of course, holds tremendous potential to realize its founding ideals, but only if it’s run more efficiently and effectively,” McMaster said. National Security Advisor H.R. 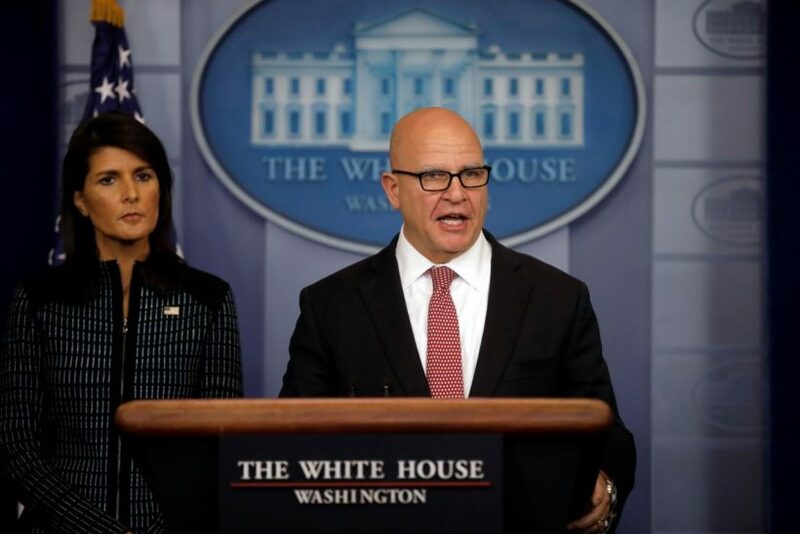 McMaster speaks during the daily briefing accompanied by U.S. Ambassador to the UN, Nikki Haley at the White House, September 15, 2017. Previous administrations have pressed the U.N. to embrace change. But, unlike past presidents, Trump is promoting his “America First” agenda, and he has called for slashing U.S. financial contributions to the U.N. The Trump administration is also shrinking the size of the diplomatic delegation at this year’s U.N. summit. Trump administration officials explained it as another a cost-saving measure…. Ambassador Haley stated that the U.S. approach at the U.N. summit would be “solid” and “strong,” as diplomats and top U.S. officials tackle global challenges. Haley confirmed that she has read a draft of the speech. “I personally think he slaps the right people, he hugs the right people, and he comes out with [the] U.S. being very strong in the end,” she said. [“I think he will make quite an impact.”]. [Also of note, on Monday President Trump will host an event at U.N. headquarters with the intent of gaining support for his reform proposals. Haley said 120 countries had agreed to attend the President’s meeting, at which Trump will propose a “massive reform package” that will make the U.N. “more effective.” This follows the president’s calls for a reform of the U.N. to lower “out-of-control costs.” Countries were invited to attend after signing on to a U.S.-drafted 10-point political declaration backing efforts by U.N. Secretary-General Antonio Guterres “to initiate effective, meaningful reform,” according to a draft of the political declaration seen by Reuters on Sept. 8th. U.N. Secretary-General Antonio Guterres speaks at a news conference ahead of the 72nd U.N. General Assembly at U.N. headquarters in New York on Sept. 13. 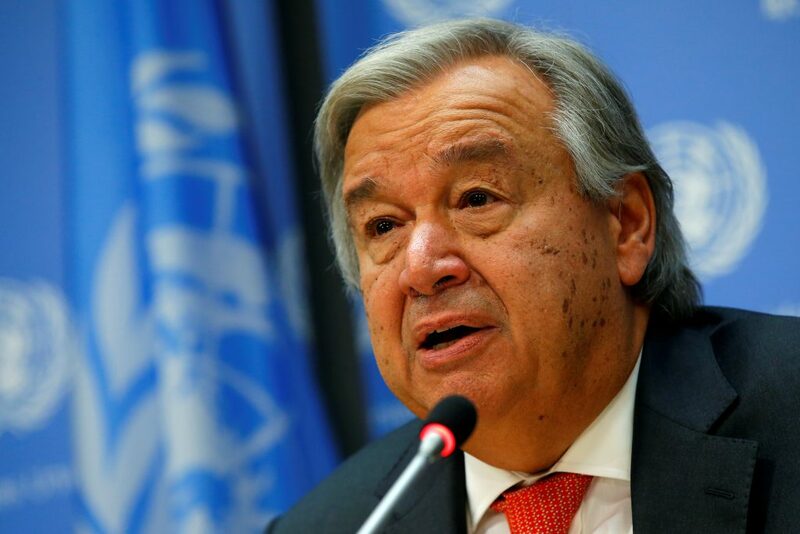 (Photo: Mike Segar/Reuters) Guterres is a former Portuguese prime minister and was head of the U.N. refugee agency for 10 years. Trump, Guterres, who also took office in January, and Ambassador Haley are scheduled to speak at the Sept. 18 event, diplomats said. “We commit to reducing mandate duplication, redundancy and overlap, including among the main organs of the United Nations,” the draft declaration reads. Compiled/adapted from news reports at NPR and Reuters. Reprinted here for educational purposes only. May not be reproduced on other websites without permission. 1. When is President Trump scheduled to speak at the annual U.N. General Assembly? 2. a) Who is the U.S. Ambassador to the UN? b) What did the Ambassador say about the direction of the U.N. following President Trump’s election? c) How does she describe the U.S. approach under President Trump at the U.N. General Assembly? 3. a) Who is H.R. McMaster? b) How did McMaster describe President Trump’s upcoming address to the U.N. General Assembly? 4. Critics of the U.N. say the world body is inefficient and does not fulfill its purpose. Previous presidents have called for change at the U.N. What has President Trump done that is different from previous presidents in their calls for change? 5. a) Of the 193 member nations of the U.N., what percentage of the budget does the U.S. contribute? CHALLENGE: What percentage do the billionaire controlled countries of Saudi Arabia and Qatar contribute? How much do China and Russia contribute? The EU? b) Do you think the U.S. should pay the percentage to the U.N. that we do? Is President Trump correct or not, to insist on all countries paying their fair share? Explain your answer. 6. a) What unprecedented diplomatic feat has the Trump administration accomplished leading up to the 2017 U.N. General Assembly? Be specific. b) Why do you think so many countries signed on to the U.S.-written U.N. reform proposal? c) Ask a parent the same question. CHALLENGE: Watch (and read) the President’s entire Tuesday (9/19) address to the U.N. General Assembly at WhiteHouse.gov. a) List the major issues the President addresses in his speech. b) For each one, what solution did he propose? c) Were you encouraged or discouraged by the President’s speech? Explain your answer. d) Ask a parent the same questions (c). Tuesday: Trump will meet with the emir of Qatar, whose kingdom is embroiled in a dispute with other Middle East nations, including Saudi Arabia, over alleged funding of terror groups. Wednesday: will meet with the heads of Jordan, Egypt and the Palestinian Authority. The White House has played down prospects for a major moment in the Middle East peace process. Trump also will sit down with British Prime Minster Theresa May. Thursday: hold a lunch with the leaders of South Korea and Japan, largely to discuss the threats emanating from North Korea.